Guglielmo Marconi, 1st Marquis of Marconi (Italian: [ɡuʎˈʎɛlmo marˈkoːni]; 25 April 1874 – 20 July 1937) was an Italian inventor and electrical engineer known for his pioneering work on long-distance radio transmission and for his development of Marconi's law and a radio telegraph system. He is often credited as the inventor of radio, and he shared the 1909 Nobel Prize in Physics with Karl Ferdinand Braun "in recognition of their contributions to the development of wireless telegraphy". Marconi was an entrepreneur, businessman, and founder of The Wireless Telegraph & Signal Company in the United Kingdom in 1897 (which became the Marconi Company). He succeeded in making a commercial success of radio by innovating and building on the work of previous experimenters and physicists. 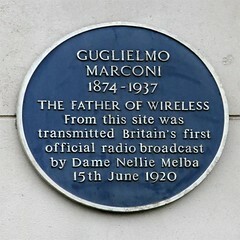 In 1929, the King of Italy ennobled Marconi as a Marchese (marquis). Guglielmo Marconi (1874-1937) inventor of a wireless telegraphy system. 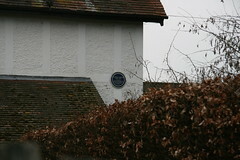 He conducted experiments from Sandbanks over a 30 year period. 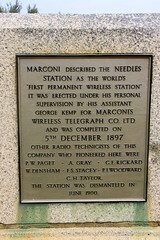 Marconi described the Needles station as the world's "first permanent wireless station". 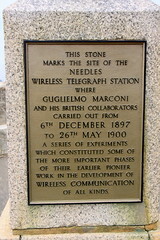 It was erected under his personal supervision by his assistant George Kemp for Marconi's Wireless Telegraph Co. Ltd. and was completed on 5th December 1897. 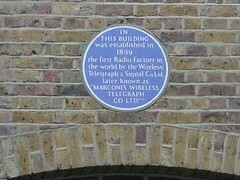 Other radio technicists of this company who pioneered here were P.W. Paget - A. Gray - C.E. Rickard - W. Densham - F.S. Stacey - P.I. Woodward - C.H. Taylor. The station was dismantled in June 1900. Guglielmo Marconi 1874-1937. 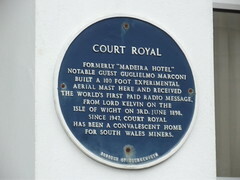 The coast at Weston-Super-Mare has historic associations with wireless telegraphy. 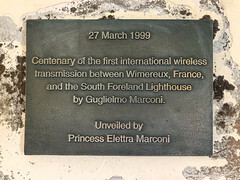 In 1897 Marconi, co-operating with Sir William Preece and other Post Office engineers, sent the first wireless signals across water from Lavernock on the Welsh side of the Bristol Channel to Flat Holm and Brean Down on this side. The first ultra-short-wave telephone, as an extension of the land-line system, linked Cardiff and Weston in 1932. 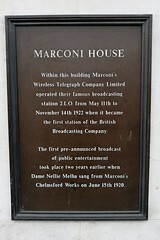 Marconi's work laid the foundation for the development of radio communication and of broadcasting throughout the world.